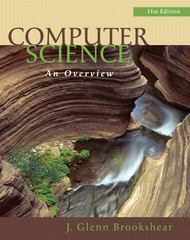 Computer Science 11 Edition Computer Science: An Overview uses broad coverage and clear exposition to present a complete picture of the dynamic computer science field. Accessible to students from all backgrounds, Glenn Brookshear uses a language-independent context to encourage the development of a practical, realistic understanding of the field. An overview of each of the important areas of Computer Science (e.g. Networking, OS, Computer Architecture, Algorithms) provides students with a general level of proficiency for future courses. The Eleventh Edition features two new contributing authors (David Smith — Indiana University of PA; Dennis Brylow — Marquette University), new, modern examples, and updated coverage based on current technology.